Two local yoga studios will be offering weekly classes designed specifically for the military and military veteran population. The first is Shine Power Yoga in Maple Shade on Saturdays at 2 p.m., and the second is at Moonshine Power Yoga in Cherry Hill on Wednesdays at 7 p.m. These Yoga for Vets classes are all donation classes and help veterans with post traumatic stress disorder, anxiety and pain management. “These yoga classes are not your typical yoga. It is geared toward those in the military. It is more firm than your typical yoga class, but the benefits and value they receive are just as strong,” said Moorestown resident CJ Keller, a Marine veteran and Yoga for Vets instructor. All veteran classes are donation based, and proceeds support Active Heroes, a non-profit committed to reducing the number of daily veteran suicides from 22 to zero, and Meghan’s Foundation, a local non-profit geared toward empowering vets with PTSD to overcome symptoms through skilled yoga practices. “It is whatever they can give. The money goes right back to them and our community. It is just another way for them to feel a sense of purpose. When we get out of the service, we want to give back and serve, and this is another way to do it,” Keller said. Keller started these classes after he had left the Marines. He joined out of a sense of duty to his country and was deployed to Iraq in 2006–2007. He had been part of the convoy operations, clearing roads of IEDs and insurgents. He was attacked and saw others injured and killed. It was traumatic, but he didn’t realize it right away. He moved to Baltimore after leaving the Marines and found himself stuck between the gap of his military life and civilian life. Not knowing how to cope, he went to the gym and drank, but it ended up being counter-productive. When a friend and former veteran who lost his leg and half of his arm suggested and showed him yoga, he found he was blown away by the experience. He learned the positions and breathing that was used in yoga could be used in everyday life to help power through discomforts and stress in a more organic and positive way. Over the course of a couple years, it took him from a “fragmented alcohol abuser with anxiety and depression” to a connected and put together person again. In 2011, Keller decided he couldn’t keep his experience to himself and decided to train to become a teacher. That summer, he started teaching Yoga for Vets. He spent four years building a community there and created a new sense of purpose and connection to veterans, others and himself. “It saved my life. I was spiraling down an emotional rollercoaster, and then I learned I could actually take charge of my own healing organically without medication or alcohol. I could save myself and empower others to do the same thing. My life had taken on purpose,” Keller said. Keller moved to Moorestown last month after he graduated from Towson University with his master’s degree in occupational therapy and accepted a job in the local area. 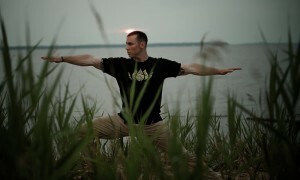 He decided to start the Yoga for Vets classes in South Jersey as he feels all veterans can and should benefit from yoga. Yoga for Vet classes have grown and are becoming a nationwide movement, according to Keller. “Since I’ve been doing it, it has absolutely grown. It’s more acceptable and accessible now for veterans to do yoga. I’m trying to get the word out and make options available, showing vets that it is OK to do yoga. It’s the way you deliver it. I was ready to move on from Baltimore. I’m here and I’m happy,” Keller said. The classes are held weekly, with no current end date, as Keller is planning to teach the yoga classes for as long as he is in the area. Anyone can join at any time as long as they can verify service, which Keller can identify with some questions. There is no need to sign up online or have a mat. Drop-ins are allowed and mats can be provided. All vets need to do is come and wear comfortable clothing for yoga. Shine Power Yoga is located at 112 E. Main St. in Maple Shade and classes began on June 6. Moonshine Power Yoga is located at 484 E. Evesham Road in Cherry Hill, and classes begin June 10. For more information, visit the Philly Yoga for Vets Facebook page or email Keller at captkeller@me.com or yoga4vets@gmail.com.